UK - The latest revision to the DEFRA June Survey had very little impact on the provisional data which was released earlier this year. 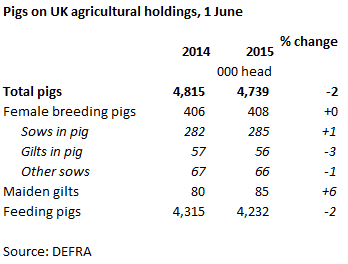 An increase of 14,000 pigs takes the total herd to 4.74 million head. However, this does not materially change the overall decline of 2 per cent compared to the previous year, although doubts remain about the accuracy of this figure, given that pig slaughterings have been consistently higher since June. Within this, the number of breeding pigs was fractionally higher, with sows in pig up slightly higher year on year, whilst gilts in pig were marginally down. Data for the Scottish and Welsh herd is now available in addition to those from England and Northern Ireland which were included in the provisional figures. The extra figures show stability in the Scottish pig herd as a small increase in breeding pigs was offset by a decline in pigs being kept for slaughter. Meanwhile, the small Welsh herd recorded a fall in total numbers compared to the previous year. In line with the UK figures, pig herds in England were smaller year on year, with total numbers down by 3 per cent. The Northern Irish herd did record strong growth, however, with the total number of pigs up 10 per cent year on year.